I like reading fiction that is unpredictable and which stays with me long after I’ve turned the final page. Stories with strong, often uncomfortable messages, about life, society and the human condition fascinate me. I love narrative and descriptive text that make characters and events come to life in my mind. If fiction touches my soul and teaches me something, I am always satisfied! Wife and mum to two teenage girls, I live on the edge of the Lake District in the UK and work part-time in insurance. I teach French to secondary-school-aged children, I'm an active member of our local village hall committee, enjoy wine and board games evenings and going on 'low-level' walks when it's dry!!! Julia Myerscough's 51 Weeks is a contemporary women’s fiction novel. Now that her husband Geoff had finished his extended birthday celebrations, which actually included a six-day holiday on the Isle of Wight with his wife and two daughters, the big five-oh was facing Amy squarely in the face. When Geoff casually asked her how she was planning to celebrate, Amy was struck with panic, fear, and even a bit of despair. The beauty of their vacation spot seemed to pale in comparison with that dreaded landmark. What had she done with her life? How could it have passed her by so quickly? A serendipitous stop at the Sir Frank Whittle Jet Heritage Centre on the way home held the answer -- she had just needed a bit of inspiration, and the short film about the pilot and inventor of the jet engine gave her exactly what she needed. It was past time for Amy to take a good look at her life and shake it up a bit, actually not just a bit, a lot. At first, she considered a bucket list, but then something infinitely more appealing and terrifying suggested itself. What about a basket filled with challenges? There would be one for each week of the coming year, and on the 51st week, she would write a book about her experiences. She thought of challenges that would make her face her fears, do good for others, improve herself and even walk a bit on the wild side. When The Girls had their next get-together at Adriano’s Restaurant, Amy told her friends what she had in mind and recruited them to write up those challenges. What would happen next was anyone’s guess. 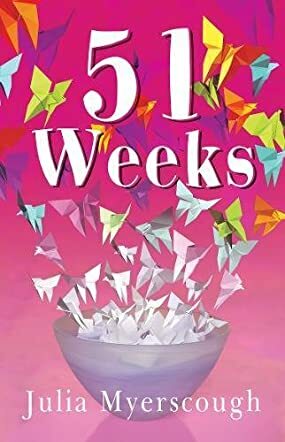 Julia Myerscough’s contemporary women’s fiction novel, 51 Weeks, is an absolute hoot of a novel. Amy’s challenges are definitely not for the faint of heart, but somehow she gamely struggles on and finds infinitely resourceful and often hilarious solutions to each week’s challenge. Along the way, Myerscough’s hero gets to take a good close look at her marriage, particularly at the way her relationship with her husband had morphed over the years. At one point, her daughter says that he treats her like a minion, and it’s hard not to grit one’s teeth a bit as Geoff continues to be obsequious, condescending and generally an awful mess of a partner. This is a stunningly good read. It’s beautifully written and the characters quickly became so real as I read on. While this title is listed in the women’s fiction genre, I had a blast reading it and found I could easily relate to Amy’s situation. Amy’s relationship and life issues transcend gender barriers, and this story is just too important to pass up because of genre. Want to read a grand book that tackles coming of age and mid-life crises all in one fell swoop? This is it. Julia Myerscough’s 51 Weeks is most highly recommended.